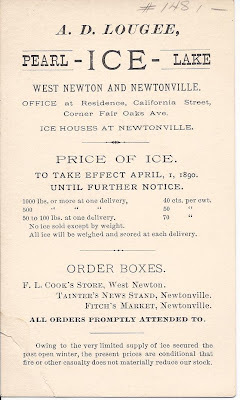 Advertising card for the A. D. Lougee Ice Company of Newton, Massachusetts, with prices for April 1, 1890. I believe the founder's name was Amos D. Lougee. What I found especially interesting about this card is the reference to an "open winter" the season before. The reverse of the card is blank. Office at Residence, California Street, Corner Fair Oaks Ave.
To Take Effect April 1, 1890. 500 " " " 50 "
50 to 100 lbs. 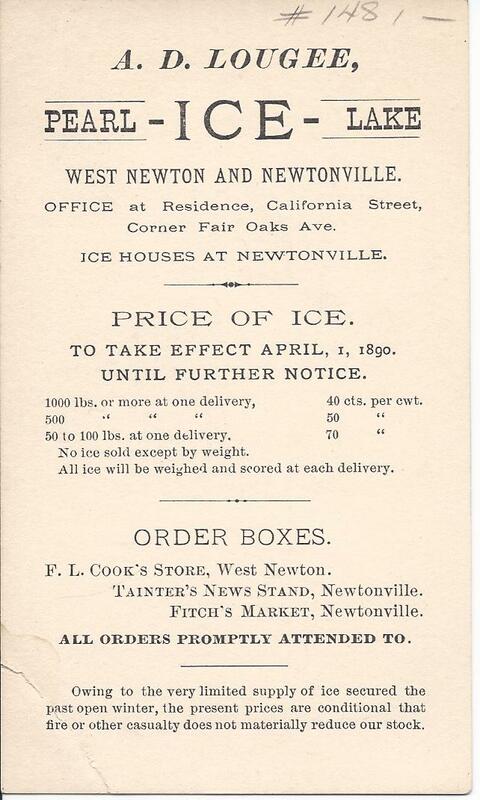 at one delivery 70 "
Owing to the very limited supply of ice secured the past open winter, the present prices are conditional that fire or other casualty does not materially reduce our stock. I found Pearl Lake on an 1878 map of Newton, at the intersection of Walnut and Homer Streets, with Walnut Street actually crossing the lake. I don't Pearl Lake on a map today; perhaps it was an impoundment whose dam was removed at some point. If you have information on the Lougee family or Pearl Lake, please leave a comment or contact me directly.